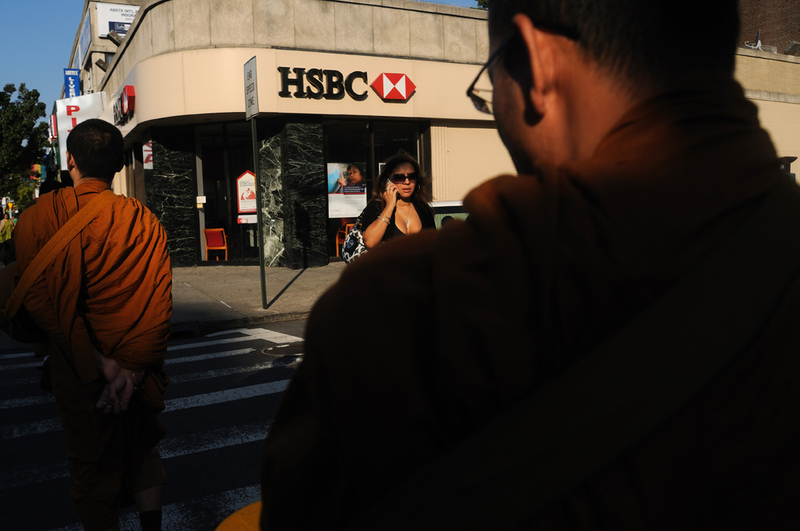 Through “It’s Personal”, a year long project, Ekkarat Punyatara, a young and emerging Thai documentary photographer observed and documented the lives of the monks in New York. 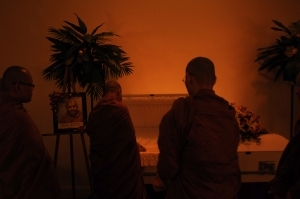 The thoughts that were shared between him and monks he defined as his ‘teachers’, he had ultimately developed his understanding towards Buddhism’s method, The Middle Way, the personal journey of each person’s mind observing very tiny feelings and moods for control and cognition of who we are. 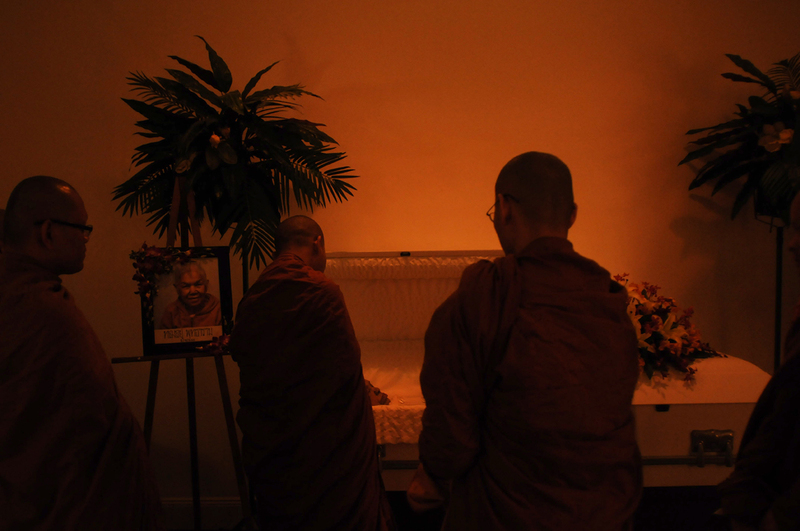 “It’s Personal” visualises the monks; the way how they live and their personal journeys through their simple daily life as human beings who stand firm on Buddha’s path, not as the holy saint, the illusion Ekkarat had felt in Thailand before he pursues this story. Ekkarat believes that we all are surrounded by lures, which our mood and temper are easily aroused. 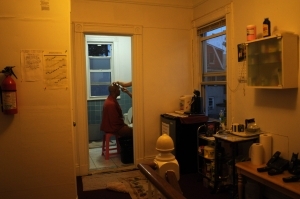 He intends to use “It’s Personal” as a tool to provoke his audiences to observe the feelings, which are aroused through this ‘Personal’ story. Early morning chanting after waking up and before going to walk alms round. Plowing snow around the temple area with several Buddhists. This kind of chore will be taken care of by Buddhists without monk's request. Waiting in line at Home Depot to pay for cement bags, used for resurfacing a concrete floor behind the temple. 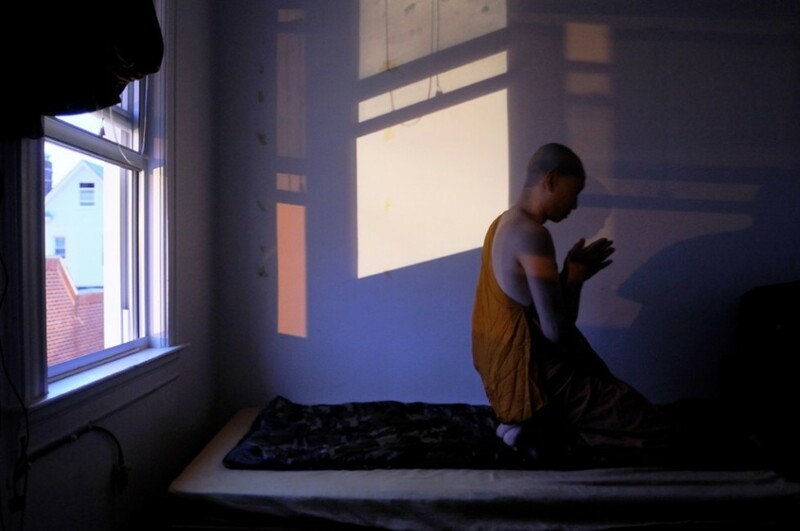 Monks praying to recite the 227 monastic rules (the Patimokkha), the monk's code of discipline. Recitation of the 227 monastic rules conducted twice a month based on lunar calendar, and been practicing for more than 2000 years ago. Buddhists stopping by to do merit hanging out and talking afterward. 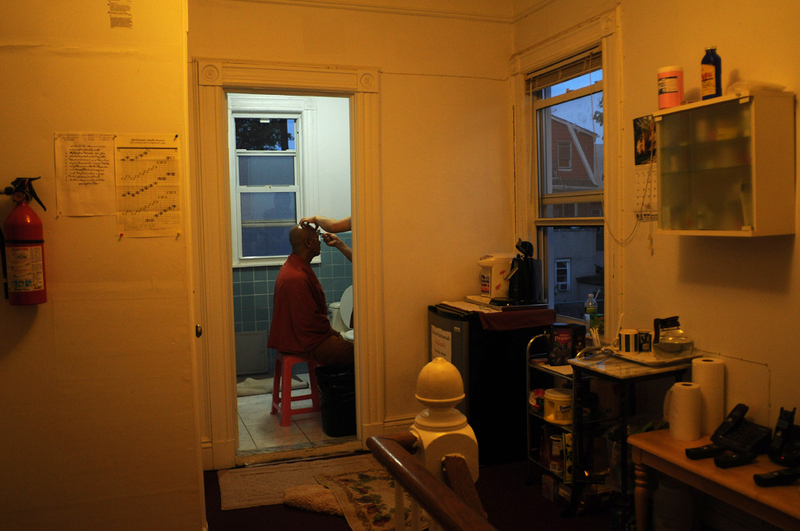 For Buddhists, temple is like a second home to meet and greet. A Thai lady is scooping rice from a Thai silver bowl and put it in a monk's alms bowl. 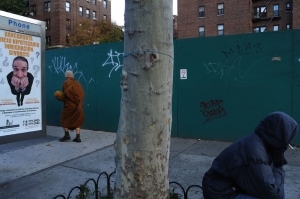 Buddhists wanting to give alms will make an appointment with monks about where to meet in the morning. Buddhists, no matter their nationalities are, can do merits and give alms to Thai monks. Preparing food for vagrant (homeless) cats living in the temple area. A Latina lady walking pass by while monks are doing the alms round. 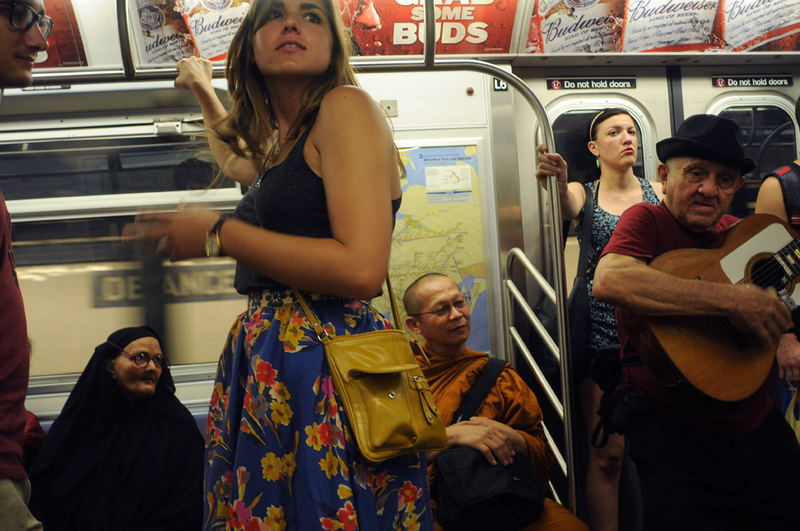 A monk taking pictures in the subway while going to Central Park. Holding a camera and taking a photo while strolling isn't right or wrong in the Buddhist scriptures, however, it is very inappropriate in Thailand. 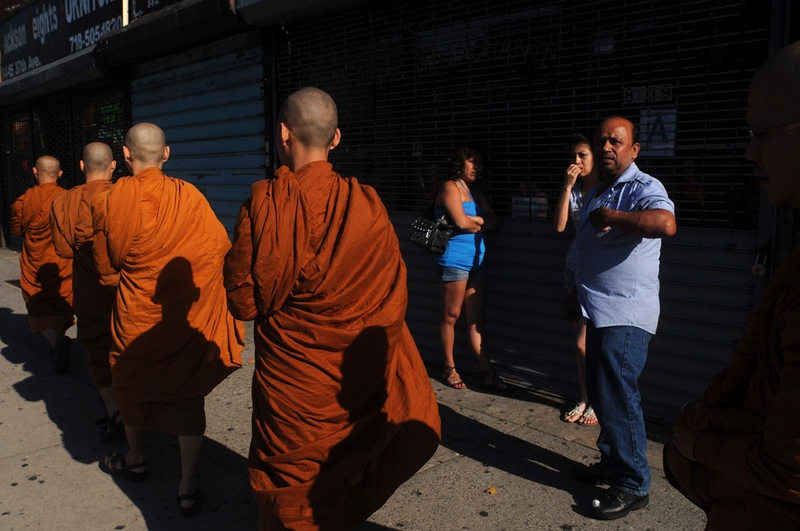 As for Thai people, Buddhist monks are supposed to be separate from secular world. 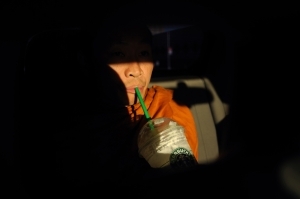 A monk while sipping Starbucks coffee, the most favorite coffee. Kathin tree (a money tree), a part of Buddhist religious ritual, held once a year. 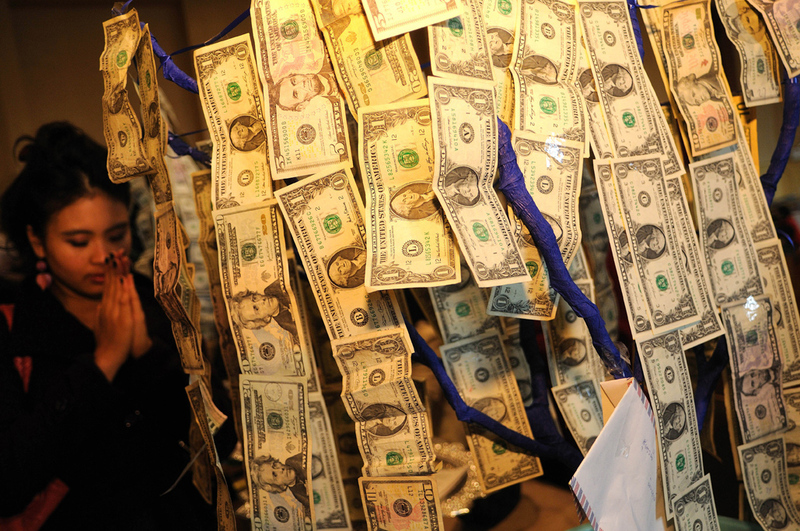 The Buddhists will clip money to the tree and donate it for merit making to the temple, and monks spending it for preserving religion.